First and foremost, I am sorry for my delinquency in my posting. Between a hurricane and a NorEastern that caused to losing power, the loss of my beloved computer (and purchase of a new beloved computer), and the performance in a Light Opera, I have unfortunately fell behind. 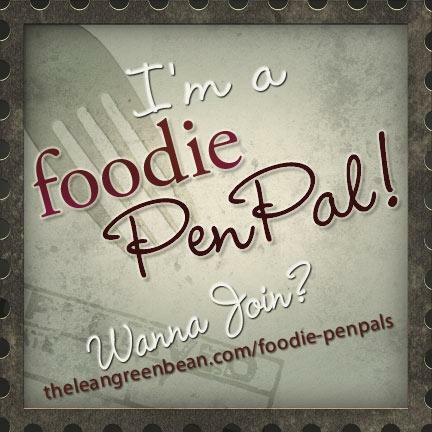 However, that just means I need to make up for it with some awesome new posts… Starting with FOODIE PENPALS!!! In October I received a fabulous package from Brandy Gamez. Brandy sent me a fabulous package filled with many things I never would have bought or tried for myself. This is one of the great things about this program. We all have different tastes and get to share those tastes with complete strangers, introducing them to foods they never would have eaten otherwise. First of the wonderful note. Then… the food! Brandy sent me some amazing rice thins. A great healthier cracker that I have thoroughly enjoyed. Some Ranch Pretzels which provided me with the perfect at work snack. An olive tapenade that is being saved for a special occasion with friends. Some smoked oysters, and you all know how I love everything smoked. A wonderful package of gelatin (I will wait till the post to show you what marvelous plans I have for this amazing ingredient. And then, the ingredient I never knew I would like… SEAWEED CRACKERS! This healthy snack substitute is flavorful and enjoyable. I may be looking for these in a store near me once I finish the ones I got. Thank you so much Brandy! I loved my package and hope you got a great one too. Check out what I sent to Maeve Bartik of Adventure with Maeve. And of course, the food! Some wonderful breakfasts in the form of pumpkin bars! Yummy! Then a cranberry apple butter which I have been delightfully spreading on my toast. An amazing box of cranberry pistachio biscotti. Now I must admit something, my Mother makes the greatest biscotti in the world. Nothing I have ever tasted is as good. That being said, this was still delicious and finished off by myself rather hastily. The extend bar and coffee are being saved for a desperate all nighter when I need to prepare for a trial, or a holiday party, or something of the sort. Then finally some baked Jalapeno Cheese Crunchies (these may have been from Brandy talked about above, the boxes got mixed up at one point, but I think I got it together right). These are like high quality spicy cheetos. Which makes them the perfect late night TV watching snack. Thank you so much Meg for the amazing holiday package. Hopefully you got some fantastic stuff as well.